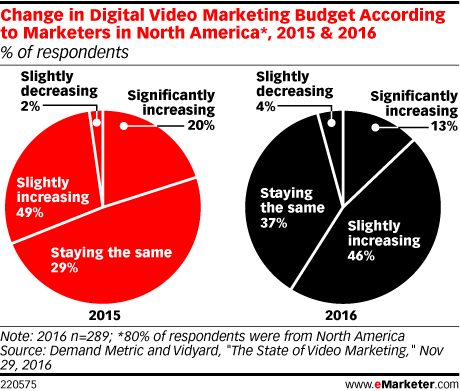 Data is from the November 2016 Demand Metric and Vidyard report titled "The State of Video Marketing." 289 marketers worldwide were surveyed online during October 5-28, 2016. 80% of respondents were from North America, 3% from Asia-Pacific, 1% from Central and South America, 12% from Europe and 4% from the Middle East and Africa. Respondents worked for organizations that were mostly/entirely B2B (54%), mostly/entirely B2C (11%), a blend of B2B/B2C (27%) and agency/studio (8%). The primary role of the respondents included marketing (71%), CEO/president/owner (13%), sales (4%) and other (12%). Demand Metric is a marketing advisory firm. Vidyard is a video marketing platform.